When you're contemplating the kids doctor office furniture decor for waiting room, you should address the children's psychological as well as physical needs. The little ones may feel scared, as well as sick. Even routine checkups, the waiting time can feel interminable to active youngsters. Start with the right children waiting room furniture, you can minimize stress and maximize the comfort for the kids and their parents. Many important factors to keep in mind include durability, safety, and entertainment. 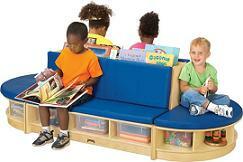 There are many options for kids doctor furniture that offer all three. Lobby furniture is a big expense, be sure to choose from our rugged options so you will not have to make this an annual purchase. All of our kids furniture is safe for little ones providing a sturdy surface without sharp objects or small pieces that could present a choking hazard. From storage compartments for toys, rack for books or magazines and interactive solutions provide entertainment to reduce the stress and irritability. You'll also want to equip the waiting room with adult-sized reception chairs or tandem seating to ensure the parents' comfort. Consider including at least some chairs without arms, to make it easy for parents to hold babies and toddlers in their laps. Choose side tables large enough to accommodate diaper bags, with space left over for a purse and a cup of coffee or water. Contact us today to place your order with free shipping!